Start your discovery in the fashion capital of the world, Milan, by reading the attractions, dining & shopping areas, major places of interest in the city. Welcome to one of the fashion capital of the world, headquarter of some of the most globally successful designers of all times, like Armani, Valentino, Prada, Versace, Ferragamo, Dolce & Gabbana and Gucci. Milan is the capital of the region Lombardia (in the northern part of the peninsula) and it probably is the most cosmopolitan city in Italy. Forget about the laud Italian stereotype, and be ready to meet a more reserved, heterogeneous and urban population. Visiting Milan, you will find out that it represents a more practical and business-oriented side of the warm and romantic vibe usually given out by Italy. The second biggest Italian city (after Rome), Milan is in fact the heart of Italy’s economy and finance, and overall a symbol of productivity within the country. But all work and no play makes Jack a dull boy: don’t worry, Milan’s dynamism translates to a remarkable activity in organizing cultural events and a very animated nightlife, making it a fairly fun and interesting place to visit. The roots of the city go back to the fifth century B.C., when it was a Gaul colony, later conquered by the Roman Empire becoming Mediolanum (194 B.C.). Although Milan preserves far more modest marks of this ancient era compared to cities like Rome, it still presents a fair share of historical wonders belonging to different ages (during which the city was occupied by France, Spain and Austria), as well as incredible monuments and sites. 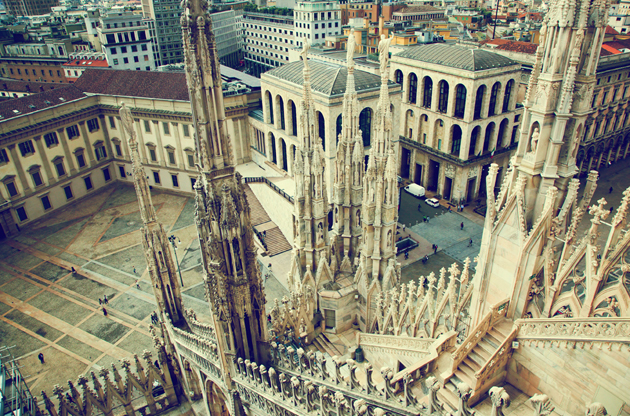 Milan is one of the many faces of Italy, a less traditional taste of its culture but equally fascinating. The city has always been able to draw attention, gaining the title of the 2015 Expo domicile. Milan rises in the river Po’s valley to the North of Italy, in an out-and-out hydro-tangle of rivers, canals, streams and irrigation ditches. With three different airports near the city, you shouldn’t have problems to get to Milan by air. Linate Airport is the closest to the city centre (10 km, about 25 minutes) and is connected via the Star Fly bus service, that makes several stops throughout the city and ends (or starts) its route at the Central Train Station. The Malpensa International Airport is further (50 km), but it’s also well supplied thanks to taxi and bus services and, most of all, the Malpensa Express, a train that runs every thirty minutes from Malpensa to Cadorna Station in Milan (40 minutes). The last airport is Orio al Serio (55 km), from which you can take the Orio Shuttle and arrive in the city in sixty-five minutes. Don’t pay attention to people that say Milan is a grey and unwelcoming city: they just don’t know it. There is a lot to be seen between art, design, literature, architecture and history. You could start with a walk in Sempione Park, making your way to the adjacent Palazzo Sforzesco, a symbol of the ducal period and location for several interesting exhibitions. In this gorgeous building it has recently been discovered a series of frescos by Leonardo da Vinci. This is not the only contribute to the city from the famous artist, who in fact gave to Milan one of his greatest masterpieces: the Cenacolo (the Last Supper) painted in the Santa Maria delle Grazie church. It’s time to get to the heart of Milan: the very popular Duomo, a triumph of gothic architecture that dominates the square of the same name. Here you have a multitude of things to do: you can admire the Galleria Vittorio Emanuele II, one of the first Liberty examples in Italy, dedicate some time to the Royal Palace and one of its magnificent temporary art exhibition, visit the ‘900 Museum, or take a walk around the San Babila area. Not to shop in Milan is pure blasphemy. In fact, shopping is one of the main reasons people travel to the city in the first place. To make a list of the boutiques you might want to pay a visit to is impossible: Milan is a gigantic atelier itself. Just venture through the streets nestled with design and clothing shops and let your tastes guide you towards the corner that most suits you. If you like luxurious things, you will find yourself in Via Montenapoleone, in Via della Spiga, at the Rinascente, or even in Corso Como, while if you prefer a more alternative style, you’ll probably end up around Porta Genova and the Navigli. You are in Italy, you eat well. That’s a given, and although Milan is not one of the strongest culinary cities in Italy, there are many world famous restaurants, both on the traditional side and more innovative ones. Keep in mind that Milan is also one of the most expensive cities in the country, which you can tell from the check. The nightlife in Milan starts with the inevitable happy hour, a true addiction for the trendy locals, followed by a quick stop at one of the fancy nightclubs in the Navigli and Garibaldi area. If you exceed of one day (or that’s all the time off you get) and you wonder how to spend it, decide between art/architecture and shopping, then follow one of the principal paths of must-see that the city has to offer. You can get around by metro, or, if the weather permits it, take one of the bicycles that the municipality makes available to everyone. You can also decide for something different, like visiting the countryside around the city or take a train to the Como Lake (45 minutes) and once there go to the city of Bellagio. Milan attracts millions of visitors every year and opposite to what you may think, not all of these are curious souls that live to travel or fashionistas. The city is one of the cities in Italy that gathers a lot of people from all over the world that come to the city in order to attend congresses, conferences, symposiums, fairs, trade shows and exhibitions. The charm of the city, when mixed with the high tech equipped venues and luxirious hotels, meet the needs of the event attendee to their fullest.